So where can you find and collect rocks and minerals? While you can find some rocks almost everywhere, it is obvious that some places are better than others. Because you want your rocks as fresh as possible (not weathered or eroded), the best places to find them are openings that are created either by humans or nature. * Mountains and particularly volcanic regions are excellent places to find large amounts of interesting rocks. * Sea cliffs, river cliffs and beaches are other classic places where rocks are laying around. * Or, you can just try to look around on the surface of the ground anywhere. 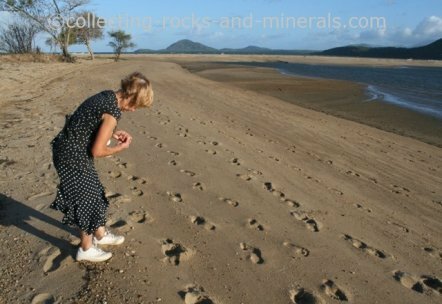 To find out about what rocks are found in a particular area, get a geological map of the area. Geological maps show the surface distribution of types of rocks in an area and you can buy them from specialist map shops. 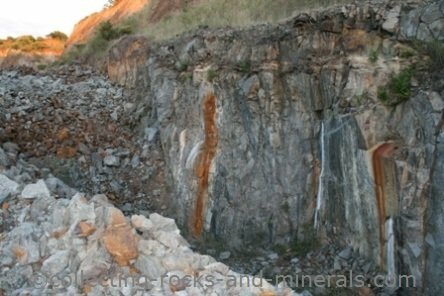 * Roadcuts (and railroad cuts) are excellent places to both admire the layers of rocks in the wall, and to collect rocks. * Old mines and old mine dumps can be good places to find rocks. Be aware though that old mines can be dangerous. Don't go in under anything that can collapse - in fact it is only the matter of time in those places. Also, there are usually more rocks to find at mine dumps than in the old mines. * Quarries are also great places to find rocks. Remember though that you need to get a permission to remove rocks from a quarry, and quarries have their legal liasons as to whom they can allow on their premises. The same applies on private land - remember that a lot of the land is owned by someone - you will need a permission from the owner to be able to access the land and remove any rocks. Remember also that removing rocks (and anything else) from national parks and different reserves may be forbidden or restricted. So check the rules!